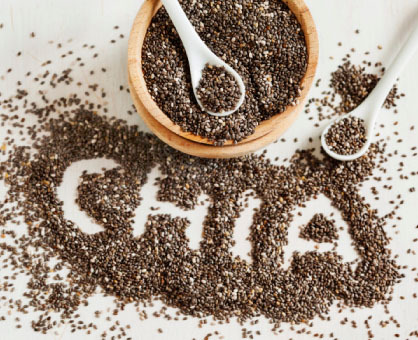 Chia seeds aren’t just for growing a chia pet anymore. They are a nutritious ingredient containing fiber, omega-3 and omega-6 fatty acids, protein, iron and calcium that can be used in a variety of ways. One of the most interesting is soaking them to create a gel causing the seeds to expand up to nine times in size and release their many nutrients. They can be soaked in any liquid including water, milk, and fruit or vegetable juice. The seed gel has the consistency of a pudding or custard. Eating chia gel can help you stay hydrated because the liquid absorbed by the seeds moves through the digestive system slowly. It is easy to make, just mix 2 tablespoons chia seeds and 1 cup of liquid in a bowl. Let stand for at least 10 minutes and then stir. Cover the bowl and refrigerate overnight or up to two weeks. The chia gel can be used to enhance recipes or to enjoy as a snack. It adds flavor and texture to fruit sauce or chutney. Make a healthy dessert using flavored chia gel as a topping for cakes, ice cream and pies, or as a layer in a parfait. In any recipe that asks for oil or butter, such as cakes, muffins, brownies or quick breads, substitute 1/4 of the fat with chia gel. Twenty-five percent is the maximum substitution ratio before a difference in taste or texture is noticed. Adding chia gel to baked goods will increase the omega-3 fatty acids of the recipe and keep the food moist and tasting fresh longer.